As we approach the final month of the Year of Mercy, it is important that we develop an action plan for success in living a life of Mercy and utilizing these next few months of extraordinary graces! The Year of Mercy will conclude on November 20th, the Feast of Christ the King, so we don’t have much time left. Here are 5 simple and practical things you can do to encounter Christ’s Mercy and spread it to others. Visit a Holy Door – Plan a day trip to visit a Holy Door of Mercy such as your local Cathedral or head on a pilgrimage to receive this powerful Year of Mercy Indulgence. 2. Develop An Action Plan for Practicing the Works of Mercy – One thing you can do as a family is develop a Mercy Resolution Plan on how you can begin (or continue) to live out a merciful lifestyle. Choose Works of Mercy that are doable for your family. 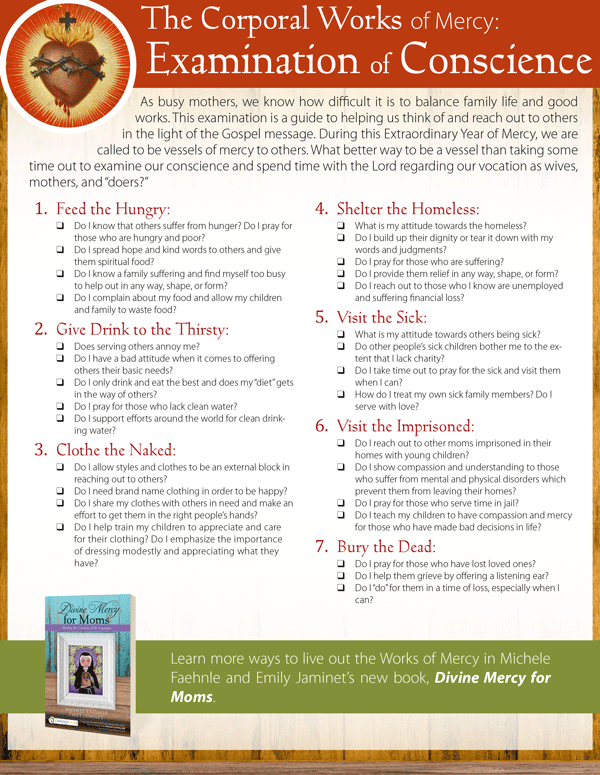 A great place to start is with a free Spiritual and Corporal Works of Mercy Check List for Busy Moms on how to live out the works of mercy! “I have asked the Church in this Jubilee Year to rediscover the richness encompassed by the spiritual and corporal works of mercy. The experience of mercy, indeed, becomes visible in the witness of concrete signs as Jesus himself taught us. Each time that one of the faithful personally performs one or more of these actions, he or she shall surely obtain the Jubilee Indulgence. Hence the commitment to live by mercy so as to obtain the grace of complete and exhaustive forgiveness by the power of the love of the Father who excludes no one. The Jubilee Indulgence is thus full, the fruit of the very event which is to be celebrated and experienced with faith, hope and charity.Furthermore, the Jubilee Indulgence can also be obtained for the deceased” -LETTER OF HIS HOLINESS POPE FRANCIS ACCORDING TO WHICH AN INDULGENCE IS GRANTED TO THE FAITHFUL ON THE OCCASION OF THE EXTRAORDINARY JUBILEE OF MERCY. Mercy letter of Forgiveness- Whom do you need to forgive? Mercy can be extended whether you are the victim or the violator. We all need God’s mercy, and a letter affirming this mercy can go a long way. Think about your many relationships in your life and decide who you might need you to extend mercy to. Pick up a pen and write a handwritten letter affirming your desire to live out Mercy in your life. 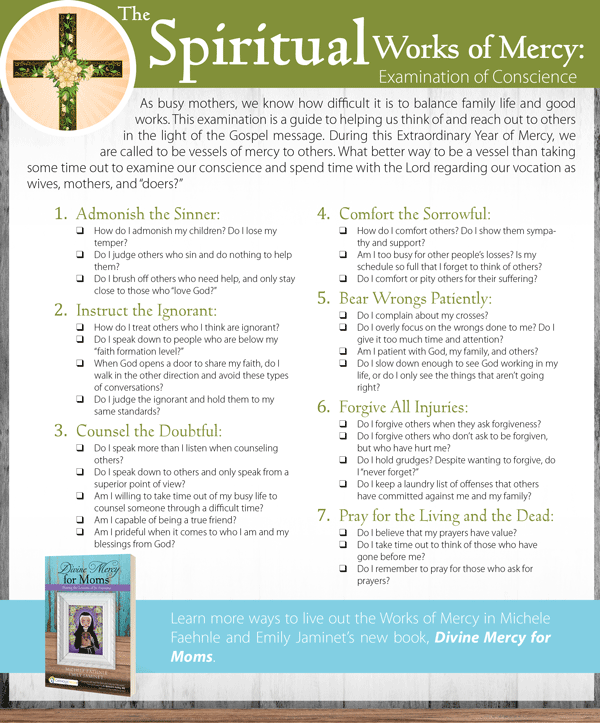 Examination Your Conscience on how you live out the Works of Mercy – Download the Corporal and Spiritual Examination of Conscience Guides, to help you reflect on how you view the Works of Mercy in light of the Gospel message. 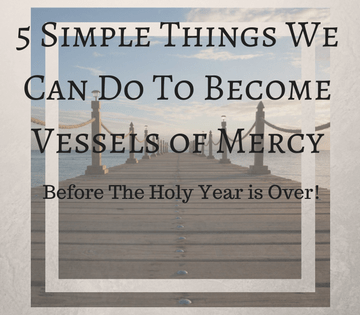 During this Extraordinary Year of Mercy, we are called to be vessels of mercy to others. This examination is designed to help you dig a little deeper into your spiritual life. This examination makes for great family dinner topic starters, a personal morning meditation or small group discussion questions for your Faith Sharing Group. May we all grow in becoming more merciful in the Year of Mercy, by focusing on obtaining these special graces provided to us and indulgences of forgiveness. May this concept of being a vessel of Mercy be the platform for how we intend to live out our the rest of lives!